Red Thread Adventures: What begins with 'F' and ends in 'uck'? 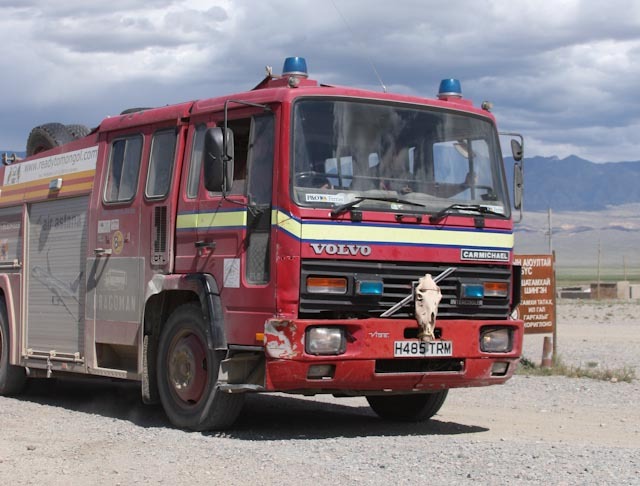 The less than 10-year old rule is waived for teams taking emergency vehicles on the Mongol Rally. This year there’s at least five ambulances, a school bus and a couple of fire engines. Having met Team Ready to Mongol at several points along our journey, we were most chuffed when they joined us at our camp halfway between Khovd and Altai. As the brave six pulled up in their trusty Carmichael/Volvo ‘H’ reg firetruck, we let them know that the price of admission for the campsite was a driving lesson for each of us. No problem! No problem at all, said Drew, just let us get set up and we’ll take you for a drive. As I advance in years it’s always a treat when I can tap into the energy and enthusiasm of young adventurers. They have no boundaries and the world is a better place for them. Drew got his LGV license as a 21st birthday present and has been around lorries all his life. He has an easy ability to instill confidence in the novice driver and in short order I’d slipped the handbrake, found second gear and started this comparative behemoth on a her way. Earlier in the day the lads had lost a spare wheel off the top of the firetruck, so our objective was to spend a half hour looking for it. We headed onto the dirt track road and despite Drew’s warnings about keeping an eye out for potholes, I opened her up a bit. Mongolia is no kinder to large vehicles than it is to small ones. We immediately hit a brace of divots and humps that had the truck nearly lifting off the ground. Naturally enough I braked, only to discover Volvo’s excellent stopping power was fully capable of throwing the rear seat passengers through the windscreen. More subtlety and finesse was required. Too soon it was time to change drivers and in short order Tom’s sure hand on the wheel had us turned around and back in time for vodkas by the stove. Lady Carmichael was donated to the Mongolian fire service at the finish line and will continue to see duty in Ulaanbaatar or its environs. When calculating the smiles per mile ratio, for about £3,000, split six ways, she was a real bargain and did the lads proud.